Churches | Jewish_support | Muslim_links. More Biblical Support and/or Letters. Spiritual: Vaccination not necessary and/or detrimental. Under Federal Laws, "religious practices" are defined by law to include moral or ethical beliefs about what is right and wrong that are sincerely held with the strength of traditional views. AFJI 48-110 was the Military regulation for "Immunization, see Paragraph 13 for exemption regulations. Are Vaccines a Gift From God? It’s fall in the northern hemisphere and more than one type of darkness has set in. Vaccines are being injected at lightning speed. New vaccines, untested vaccines, double-strength flu vaccines for the over 65 group; none of which have been shown to be effective at keeping anyone healthy. Vaccines contain animal products which require the death of animals. Some vaccines contain the 'cell line' from an aborted human baby. Additionally, Hindus and some Buddhists refrain from eating meat. They believe in not killing anything with a face, but also the slaughtered animal will carry the energies of fear, pain, anxiety etc. For meditation purposes it is counter productive to take those negative energies into the body. Vaccinations, not proven to prevent disease, result in death and mental and physical injury. According to Registered Dog Breeder, Ashleigh Oulton in Australia, animal populations become sterile after many generations of being vaccinated. This is arguably genocide depending upon the intent behind the policy. Under the idea that religion is a system or matter of conscience or ethics, anyone, even an athiest, is entitled to say, "Vaccination is ethically wrong, therefore I and my children are entitled to exemptions." The act of vaccination clearly puts the recepients life and health at risk. Some states require that parents belong to a religion that has a written tenet opposing vaccination (several state high courts have found this requirement unconstitutional). Some 16 states provide for philosophical or "personal belief" exemption, but most parents are unaware of these exemptions and fewer than 1 percent in most states exercise them. ... All states allow a medical exemption and some states allow philosophical and/or religious exemptions. www.vaclib.org/pdf/exemption.htm - 23k Exemption Form page for most states. "Aborted Fetal Cell Line Vaccines And The Catholic Family"
A site devoted to showing a Christian viewpoint on vaccines with an abundance of articles. Let me get this straight. Humanity had been successfully evolving for eons. Evolution of the species had been occurring with survival of the fittest. Measles, mumps, chicken pox and more, including smallpox and polio, had remained standard challenges in an ongoing process of natural selection. "The actual fact, and the truth in the matter is that contagion comes from within. So long as we live a common-sense life, feeding our bodies upon the pure foods which come from the vegetable kingdom, taking a sufficient amount of exercise, and keeping mentally active, we may rest secure in the promise that the Lord is our refuge. There shall no evil befall us so long as we thus show our faith by our works. On the other hand, if we belie our faith in God by disregard of His laws our expectations of health are vain." Note: Max Heindel, the author of the above paragraph, also said (before 1919) that vaccines make it more difficult for the real person, the spirit within to use the body. That idea was based upon undesirable changes in the blood steam. The note below about Credo Mutwa is perhaps a clue to how vaccines make it more difficult to be in touch with 'the still small voice within' and also interfere with sensitizing the body sufficiently to enable extended vision. Longer article in a MSDOC file. Rudolf Steiner's comments (see excerpt below) leave no doubt about the “hidden agenda” behind the plan to vaccinate all the world's children with as many vaccines as possible, thus devastating their spiritual development. Report on Vaccination by Philip Incao. M.D. Here, from 1917, is a caveat from Dr. Rudolf Steiner who warns of more dire consequences of this vaccination technology. coming to the land and all the children must be vaccinated. must not go to the trading store to get your vaccination. I noticed this hundreds of times." "In conclusion, vaccines are a perfect manifestation of everything that is satanic. They represent an adulterous and arrogant tampering with divine creation, based on the intellectual conceit of "perfecting" creation. They are poisonous, containing derivatives from metals such as mercury and aluminum, and from formaldehyde. They are made from the cell lines and viruses of biblically unclean animals such as monkeys, cats, etc. Worst of all, they are made from the cell lines of premeditatedly murdered children. When such abortion-derived vaccines are injected into other living human beings, a subtle form of cannibalism has occurred, a satanic sacrament has been partaken of, straight from the "table of demons" (1 Cor. 10:21). " Does the Bible command Christians to "give unto evil?" Tenets We believe that the human body is the holy temple of God. Therefore, our faith prohibits corporal punishment of children, and exposure of the body to unnatural, toxic or harmful substances, such as cigarettes, artificially engineered vaccines and immunization agents, and chemical perfumes. Membership If you share our faith and commit to live by the Tenets, you can become a member and obtain your membership certificate online. The second tenet: we believe that by the 5th Commandment God intends decisions made by Fathers and Mothers for their children to be honored by all of society. God instructed Moses to deliver His laws to all of the people. The Universal Family Church believes that God intends parents to be the ultimate authority when it comes to making health decisions for their children. We also believe God intends individuals to be the ultimate authority when making health decisions for themselves (1st Corinthians19). Many of the ministers and elders of the Lifespirit Congregational Church are deeply troubled by the proliferation of vaccination and the spiritual harm arising from this invasion of the Body Temple, and have asked for Guidance from the Church. Such Guidance has been received directly from Source. Thus says the Source: Thou shalt not allow the entry of abominations and unholiness into the bodies of thy children and thy own selves, for they are God's Temples and sacred unto thy Source. Source states: LCC communicants are specifically directed by their ecclesiastical supervisors to object to any of the following unholiness and abomination entering the Body Temples of themselves or their children, as a violation of the free exercise of their religious beliefs and the moral obligations of their religion. Procedure required by Church of Illumination to accept a "member-at-large." Contact the Church and request a free booklet detailing the tenets of the the Church of Illumination. If you send back a signed letter testifying to the fact that you have read the booklet, agree with its tenets and desire to become a member-at-large of the Church of Illumination, then your application will be considered. Legitimate members of the Church may be issued vaccination exemption letters. Branch Churches of Christ, Scientist and Christian Science societies welcome all visiting and permanently stationed service personnel and their families. You're invited to attend Church services, including Sunday School, and to visit any Christian Science Reading Room. If your duty permits, you're welcome to consider the possibilities of branch membership. Of course, you can join and be an active member of The Mother Church, The First Church of Christ, Scientist, from any location. Congregation of Universal Wisdom has tenets against injection of substances that defy natural law including tuberculin test matter and vaccines. 10. We believe that we are responsible for our own health. We believe that physical health is primarily a reflection of God's Universal law of cause and effect. A man reaps what he sows. How we feed and care for our bodies does impact our health and the health of our offspring. See the above web site for more information on this organization and its support for freedoms provided for in the US Constitution. Detailed Religious Letter - you may modify for your own use. Model letter to Mormon Church by member. "Dr Abdul Majid Katme, head of the Islamic Medical Association, is telling Muslims that almost all vaccines contain products derived from animal and human tissue, which make them "haram", or unlawful for Muslims to take." Dr. Katme challenges the use of vaccination both within the religion of Islam and within medicine. Dr. Katme was born in Lebanon and resides in the United Kingdom, where is spokesman for the Islamic Medical Association UK. A campaigner for natural and Islamic medicine, Dr. Katme presents each week on a weekly health show on IQRA (Sky 826) in the United Kingdom, and is additionally a radio broadcaster on three Muslim radio programs each week. Kevin A. Muhammad's site has information on various aspects of vaccinations and health. Items found include information, a call for a moratorium on vaccinations, DVDs and Books on diet, swine flu vaccine, and other vaccination topics. Please allow us to send you this letter regarding our deep concern and discoveries in vaccines. Today there are thousands of websites and organisations and non Muslim doctors who are QUESTIONING vaccines and opposing it from health point of view. Besides, we discovered that almost all vaccines contain many MUHARRAMAT and many Najassat(unclean materials) and unhygienic ingredients. [Archive - Arabic language] www.healthywithoutvaccines.org Alternate source of above web site. ... an educational resource on vaccination and immunization aimed at giving parents the facts and knowledge to make the right choices and decisions for those under their care. Note: Similar to the Christian community, protests against the blood polluting nature of vaccines are made by only a minority of insightful individuals. Allah Azza Wa Jal has created man in an excellent form. He is Allah's Viceregent on earth, hence he is Ashraful Makhluqaat or the Noblest of Creation. By virtue of his inherent and intrinsic beauties and excellence, intelligence and spirituality, man surpasses all other species of creation. Man is a unique entity equipped with a natural immune system having the potential to fight all harmful and alien microbes, viruses and bacteria. If man leads his life in strict accordance to the divine advices, admonitions and restrictions pertaining to health, hygiene and morality, his health will remain secured from attack by harmful bacteria, sicknesses and disease. The kuffaar, however, find imperfection in the Handiwork of Allah Ta'ala and are endeavouring to boost the defence mechanism of health by filthy artificial means which are fraught with health hazards. 1. Religious: the viewpoint that pollution of the temple of the spirit is ungodly. 2. Philosophical: the viewpoint that vaccination is unnatural. 3. Moral: the viewpoint that making animals sick to obtain vaccine ingredients is immoral. 4. Aesthetics: the viewpoint that it is repulsive to put cow pus, rotting material, etc. in the body. 5. Science: seeking answers, can health be improved or protected by putting poison in the body? 6. Health: the viewpoint that better ways than vaccination exists. 7. Sales: the viewpoint that Billion dollar profits are good. 8. Superstitious: the viewpoint that a few children must be sacrificed for the good of all. 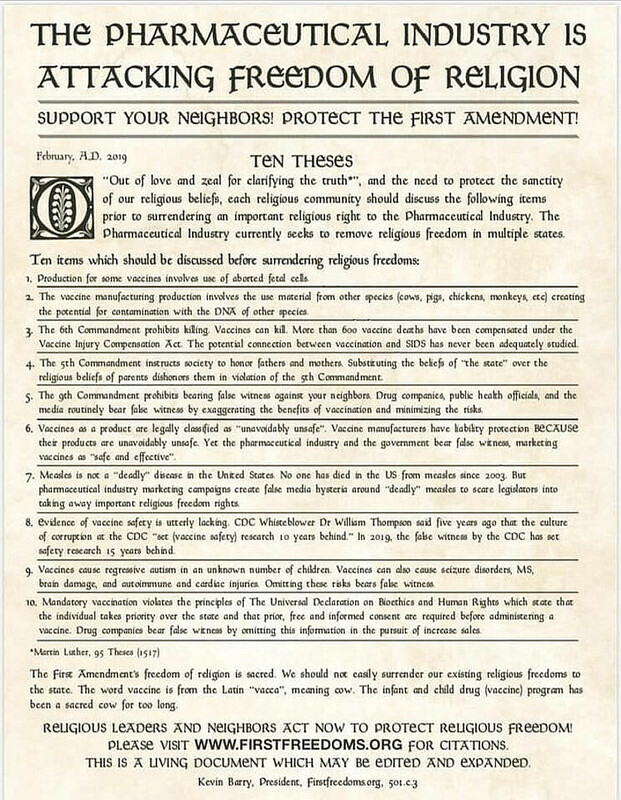 The right to claim exemption from immunization based on religious beliefs is available to all persons who hold religious beliefs against immunization regardless of what any state statute may say regarding the necessity for membership in any particular religious group or church. A good Summary of the concept that one is not required to hold formal church membership can also be found at: http://www.alaskawellness.com/archives/school-vacc.htm. Quote: "According to Black's Medical Law Dictionary, your religion is your personal belief with God and has nothing to do with what church you go to. Therefore, if you feel that mandatory vaccinations that carry known risks including death and brain damage are against your religious beliefs and that God gave you your children to raise, you should have no problem using this exemption." There are many links on this page that relate in some way to "legal". Please browse. "But the cowardly, unbelieveing, abominable, murderers, sexually immoral, sorcerers, idolators, and all liars shall have their part in the lake which burns with fire and brimstone, which is the second death." Bible on End Time Pharmaceuticals "...for by your medication were all the nations deceived." "...For your merchants were the great men of the earth, for by your sorcery all the nations were deceived."